The wet look was initially made famous by celebrities such as Kim Kardashian, the Olsen twins, and Kendall Jenner. It's a sassy and straightforward hairstyle for days where you're craving versatility. 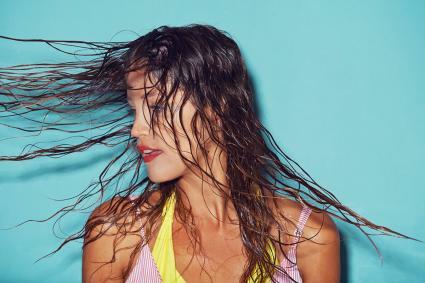 Whether you choose to mold your tresses into a chic updo or leave them loose and effortless, the wet hair appearance is easy to adopt once you know how. Contrary to popular belief, you don't need wet hair to achieve this aesthetic. In fact, if you try to style wet hair, it will air-dry eventually and leave you with a very different outcome. "Always start with clean hair as this look is always better with a smooth finish," says Rebecca Shann, hair stylist and owner of Hair and Beauty by Becky. "Once you've stepped out of the shower, apply heat protection spray and blow dry your hair as straight as you can." Clip your mane into small sections and work from the base of the neck up, straightening each section. "Sectioning makes the process easier and gives you a better finish," says Shann. Add hair gel, oil or serum to your roots in small sections. To get a more even application, Shann recommends rubbing the product in your hands before you apply it with your palms. Also, stroke from the front of your hairline backward for the slicked-back look without a parting. To create more volume, use a tailcomb or teasing brush to backcomb your hair at the roots. To do this effectively, grab a small section of hair and hold it upright. Start a couple of inches from the roots and backcomb towards the roots to produce a natural lift. Use your comb to smooth over any flyaways at both the roots and the ends. Finish off the style with a few spritzes of hairspray for long-lasting hold. If the slicked-back, long-and-loose version of this style doesn't suit your personal taste, there are other variations that you can explore. From a modern ponytail to casual waves, this is a versatile look. Follow the above steps, but avoid building volume into your roots. Comb the gel into your hair so that it lies flat against your head. Tie your ends into a high or low ponytail. To refine and polish off this hairstyle, grab a small section of your ponytail and wrap it around your hair tie to conceal it. Pin this section in place using bobby pins and spray all over with hairspray. Grab a mousse and work it into small sections of your tresses. Scrunch your hair during application to achieve effortless beach waves. Make sure that you take the mousse as high as your roots so that your hair looks like it's naturally wet and wild. Part your hair into a side or middle parting. Rub an oil, gel or serum into small sections of your tresses and work through your entire head. Pull your hair back into a rough low ponytail, leaving a few thin strands out at the front and just behind your ears. Tie with a hair tie. Spray your mane with hairspray to allow all-day wear. The wet look is a unique and stylish hairstyle that's ideal for work or play. Simply experiment with different styles and products to find out what works best for you. And remember: all you need is confidence (and dry hair) to pull it off.